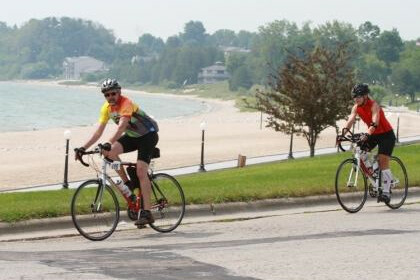 The beautiful shoreline of Lake Michigan is the picturesque setting for a weekend of riding the shore for a cure! We invite you to join up to 1,500 cycling enthusiasts who will pedal 150 miles in support of a cure for blood cancer. Your life will be changed as you are cheered on and supported on the route by blood cancer survivors and their families! The Scenic Shore 150 Bike Tour is a two day, 150 mile, fully-supported cycling event that is open to riders of all ages and abilities. One of Wisconsin's most popular bike rides, the Scenic Shore 150 is the largest locally organized and supported event for the Leukemia & Lymphoma Society. With 1,200 riders raising over $1.1 million we continue to be one of the premier charity cycling events in the Midwest. Itinerary: Saturday, July 23, 2016: Riders pedal 75-miles north from Mequon to Manitowoc then spend the night in Manitowoc. Sunday, July 24, 2016: Riders begin the final 75-mile stretch toward Door Country, ending in Sturgeon Bay.